Teaching Tai Chi is a great way to help make a difference in other people’s lives while keeping yourself balanced, flexible and strong in the process. Our instructor training is informative and inspirational, designed to give you effective tools and techniques for learning and teaching Tai Chi. 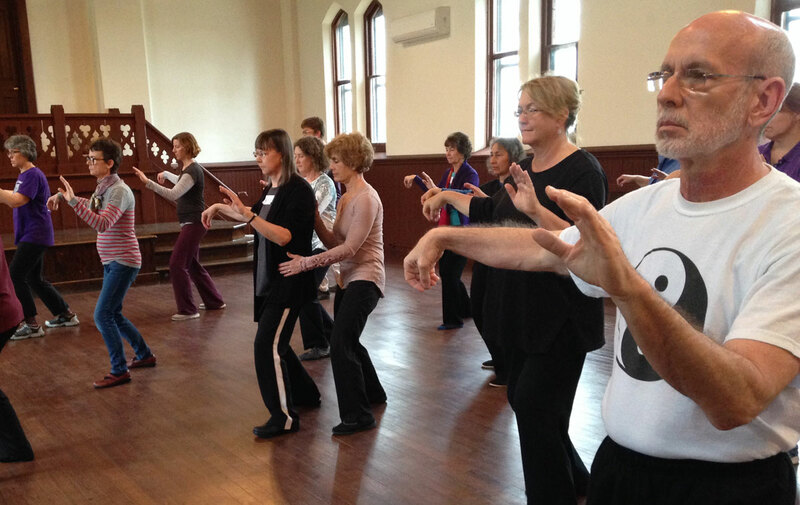 It will take you a few months of practice in order to master the Tai Chi Fundamentals® (TCF) Program or the TCF Adapted Program Basic Moves and Form well enough to become an effective teacher. The great news is: daily Tai Chi practice is good medicine for your mind and body. You need no special clothing or equipment, it takes just a few minutes every day, and you can practice almost anywhere! Health professionals can begin applying the Basic Moves (AKA Movement Patterns) therapeutically immediately after completing Course One: TCF Adapted Program Basic Moves Training Course (formerly Levels 1-2). To prepare for TCF Adapted Program Certification, first attend Training Courses. Everyone starts with Course One: TCF Adapted Program Basic Moves Training Course (formerly Levels 1-2) and then takes Course Two: TCF Adapted Program Short Form Course. Practice on your own. Attend Movement Intensives or take classes or private lessons with a certified TCF Instructor to complete your contact hours. Many people need additional training in order to be ready for certification. To prepare for the original TCF Program Certification, attend Training Courses. Everyone starts with Course One: TCF Adapted Program Basic Moves Training Course (formerly Levels 1-2) and then takes Course Two: TCF Adapted Program Short Form Course. This will give you a basis for more easily learning the original TCF Form. Then Attend Course Three: Original TCF Program Form Training Course. Practice on your own. You can attend Movement Intensives or take classes or private lessons with a certified TCF Instructor to complete your contact hours. Many people need additional training in order to be ready for certification. NOTE: If you do not wish to learn the Adapted Program Short Form and want to learn the original TCF Form directly, experienced tai chi practitioners and those with excellent movement learning skills may proceed from Course One to Course Three Form if recommended by a Course One instructor. Practice on your own with program DVDs and Books and/or attend classes with TCF Certified Instructors until you have mastered the training materials. Complete the Movement Test, a 1.5 hour one-on-one session with a TCF Certification Reviewer: demonstrate proficiency in performing movements and knowledge of guidelines, benefits, program rationale and how to help do postural adjustments for students.